Sleep Medicine : Polysomnography including sleep scoring for obstructive sleep apnea and other sleep disorders. Recipient of American Academy of Neurology 2006 Annual Meeting Resident Scholarship. Recipient of American Epilepsy Society (AES) Epifellow’s Scholarship 2006. 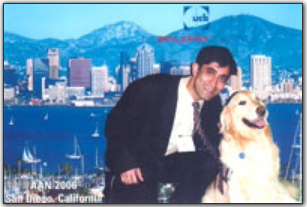 Recipient of American Epilepsy Society (AES) TopScholar Fellowship Award 2007. Dissertation (during residency in Internal Medicine) on Sleep Apnea Syndrome- a clinicopolysomnographic co-relate. Reddi R. Sethi NK. Anand I. Sethi PK. Top of the basilar syndrome due to “BATS”. Journal of Indian Academy of Clinical Medicine, Vol.3.No.3, July-September2002; pp295-296. Sethi NK. Sethi PK. Pictorial CME. Hallervorden Spatz Disease--Eye-of –the-Tiger sign. JAPI.Vol51.May2003. Sethi NK. Sethi PK. Anand I. Acute Arsenic poisoning mimicking Guillain Barre Syndrome. Int J Med Toxicol 2003; 6(2): 11. Sethi NK. Sethi PK. Brainstem death –Implications in India. JAPI.Vol51.Sep2003. Sethi, NK, Choi C, Douyon P, Staicu C,Torgovnick J, Zablow B, Hirshfeld A, Robilotti E. Images in clinical medicine: Moyamoya. The Internet Journal of Radiology.2005.Volume 4 Number 1. Nitin Sethi, Josh Torgovnick, Carolyn Martin & Edward Arsura: Churg-Strauss Syndrome (CSS) Manifesting With Mononeuritis Multiplex Due To the Use of a Botanical Solution: A Case Report: The Internet Journal of Neurology. 2005; Volume 5, Number 1. N.K. Sethi, E. Robilotti & Y. Sadan: Neurological Manifestations Of Vitamin B-12 Deficiency: The Internet Journal of Nutrition and Wellness. 2005; Volume 2, Number 1. Sethi PK, Khandelwal D, Sethi N. Cadmium exposure: Health Hazards of silver cottage industry in developing countries. Journal of Medical Toxicology, Volume 2, Number 1.March 2006. Sethi Nitin, Mullin Paul, Torgovnick Josh, Capasso Giuseppe. Nitrous Oxide “Whippit” abuse presenting with cobalamin responsive psychosis. Journal of Medical Toxicology. Volume 2, Number 2.June 2006. N.K. Sethi, J. Torgovnick, C. Macaluso, E. Arsura, S. vanSwam, S. Wright & A. Cocina: Images In Neurology: Cortical Laminar Necrosis Following Anoxic Encephalopathy: The Internet Journal of Radiology. 2006; Volume 4, Number 2. N. K. Sethi, J. Torgovnick, I. Omeis, S. Wright, S. vanSwam & E. Robilotti: Images In Clinical Medicine: Snake In The Brain: The Internet Journal of Radiology. 2006; Volume 4, Number 2. N.K. Sethi, J. Torgovnick, A. Mohan, A. Hirschfeld, B. Zablow & I. Omeis: Images in Clinical Medicine: Hyperdense MCA Sign: The Internet Journal of Radiology. 2006; Volume 4, Number 2. Sethi PK, Sethi NK, Torgovnick J. Mobile phone artifact. Clin Neurophysiol. 2006 Aug;117(8):1876-8. Epub 2006 Jun 22. N. K. Sethi, J. Torgovnick, I. Omeis, S. Wright, S. vanSwam & E. Robilotti: Images in Clinical Medicine: Snake in the brain: The Internet Journal of Neurology. 2006; Volume 5, Number 2. Prahlad K. Sethi, Reena Thukral, Nitin K. Sethi & Josh Torgovnick: Is There A Role Of Steroids In IVIG Failed Cases Of Guillain Barre Syndrome? : The Internet Journal of Neurology. 2006; Volume 5, Number 2. N. K. Sethi, J. Torgovnick, V. Novak, A. Cocina, S. D. Law & E. Robilotti: Vertebral Artery Dissection Due To The Use Of A Hand Held Electric Massager: The Internet Journal of Neurology. 2006; Volume 5, Number 2. Sethi N, Sethi P. Palm pilot dementia. Eur J Neurol. 2006 Sep;13(9):e1. Sethi NK, Torgovnick J, Macaluso C, Arsura E. Cortical laminar necrosis following anoxic encephalopathy. Neurol India. 2006 Sep;54(3):327. Sethi, P.K. ; Thukral, R. ; Sethi, N.K. ; Torgovnick, J. Images in Clinical Medicine: Miliary Tuberculosis of the Brain. Eur Neurol 2006;56:175 (DOI:10.1159/000096183).38) Sethi PK, Khandelwal D, Thukral R, Sethi NK, Torgovnick J. Neuroimage: Monomelic amyotrophy. Eur Neurol 2006 Oct 26;56(4):261. Torgovnick J, Sethi N, Arsura E. Colchicine and HMG Co-A reductase inhibitors induced myopathy—A case report. Neurotoxicology 2006 Dec;27(6):1126-7. Sethi NK, Sethi PK, Torgovnick J. Chest percussion artifact. Clin Neurophysiol. 2007 Feb;118(2):475-6. N.K. Sethi, J. Torgovnick, E. Arsura, E. Robilotti, S. vanSwam: Neurological Manifestations In A Patient With SLE Complicated By TTP: A Case Report. The Internet Journal of Rheumatology. 2006. Volume 2 Number 2. P. K. Sethi, A. Batra, N. K. Sethi, J. Torgovnick & E. Tortolani: Compressive Cervical Myelopathy Due To Sirsasana, A Yoga Posture: A Case Report: The Internet Journal of Neurology. 2007; Volume 6, Number 1. N. K. Sethi, J. Torgovnick, E. Arsura, E. Robilotti & S. vanSwam: Neurological manifestations in a patient with SLE complicated by TTP: The Internet Journal of Neurology. 2007; Volume 6, Number 1. Sethi NK, Labar D, Torgovnick J. Myoclonic epilepsy masquerading as a tic disorder. Clin Neurol Neurosurg. 2007 Mar 30; [Epub ahead of print]. Sethi PK, Sethi NK, Torgovnick J. Red forehead dot syndrome and migraine. J Headache Pain. 2007 Apr;8(2):135-6. Epub 2007 May 11. Torgovnick J, Sethi N, Arsura E. Cerebral hyperperfusion syndrome presenting three weeks after carotid endarterectomy. Braz J Cardiovasc Surg 2007; 22(1): 116-118. N. K. Sethi, J. Torgovnick , P. K. Sethi: Motorized bed artifact in the Intensive Care Unit: The Internet Journal of Neuromonitoring. 2007; Volume 4, Number 2. N. K. Sethi, P. K. Sethi, J. Torgovnick: Periodic Sharp Wave Complexes in Patient with Creutzfeldt-Jakob Disease. The Internet Journal of Neuromonitoring. 2007. Volume 4 Number 2. N. K. Sethi, B. Kosofsky, J. Torgovnick, G. Solomon, E. Arsura & P. K. Sethi: Images in Neurology: Hypsarrhythmia: The Internet Journal of Neurology. 2007; Volume 7, Number 1. N. K. Sethi, J. Torgovnick, M. Ebben, E. Arsura , P. K. Sethi: Nocturnal Panic Attacks Mistaken For Frontal Lobe Epilepsy: The Internet Journal of Neurology. 2007; Volume 7, Number 1. N. K. Sethi, P. K. Sethi, J. Torgovnick & E. Arsura: Telephone artifact in EEG recordings: The Internet Journal of Neuromonitoring. 2007; Volume 5, Number 1. Sethi NK, Torgovnick J, Arsura E. Comparison of Levetiracetam and controlled-release carbamazepine in newly diagnosed epilepsy. Neurology. 2007 Aug 28;69(9):937. N.K. Sethi, P. K. Sethi , J. Torgovnick: Images in Neurology: Periodic Sharp Wave Complexes in patient with Creutzfeldt- Jakob Disease: The Internet Journal of Neurology. 2007; Volume 7, Number 2. Sethi NK, Torgovnick J, Sethi PK. Cryptococcal meningitis after Imuran (azathioprine) therapy for autoimmune hepatitis.Eur J Gastroenterol Hepatol. 2007 Oct;19(10):913-914. Sethi NK, Torgovnick J, Arsura E. Refractory status epilepticus in children-when do we stop treatment? Eur Neurol. 2007 Oct 11;59(1-2):94-95. Sethi PK, Khandelwal D, Sethi NK, Torgovnick J, Arsura E. Disseminated nocardiosis. Clin Neurol Neurosurg. 2007 Oct 4; [Epub ahead of print]. PK Sethi, Anand, Ranjan, NK Sethi & Torgovnick: Stroke: The Neglected Epidemic, an Indian perspective: The Internet Journal of Neurology. 2007; Volume 8, Number 1. N.K. Sethi, N. Schaul, D. Kolesnik, D. Labar, P.K. Sethi: Laptop artifact during electroencephalography. The Internet Journal of Neuromonitoring. 2007. Volume 5 Number 2. N.K. Sethi, P.K. Sethi, J. Torgovnick & E. Arsura: Physiological and non-physiological EEG artifacts: The Internet Journal of Neuromonitoring. 2007; Volume 5, Number 2. Sethi PK, Sethi NK, Torgovnick J, Arsura E. Cysticercosis of the temporalis muscle: an unusual cause of temporal headaches. A case report. J Headache Pain. 2007 Oct;8(5):315-6. Epub 2007 Oct 23. Harden C, Sethi NK. Special issues in older women with epilepsy.